This is the definitive guide to Irish beef, covering every aspect of buying, preparing and cooking it. Pat Whelan, Ireland’s foremost butcher, shares the benefit of his inherited expertise as a fifth-generation farmer and butcher, empowering readers with the knowledge to seek out the very best beef available. 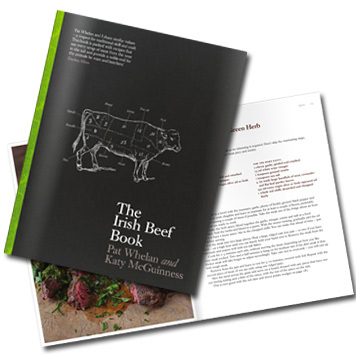 Katy McGuinness shows you how to create delicious dishes using every part of the animal with recipes selected to ensure that this is the only guide to cooking beef the domestic cook will ever need. The classics are all included, as are quick and easy midweek suppers and more complex dishes for leisurely weekend entertaining. There is a whole section devoted to the perfect steak, and the chapter on roasting removes the fear factor from Sunday lunchtime once and for all. With beautiful photography taken on the farm as well as in the kitchen, this unique book is one to celebrate. His knowledge of animals and butchery gives him an edge and Pat is enthusiastic about teaching everyone the joys of meat cookery. 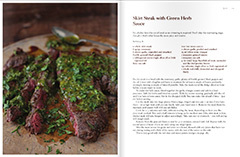 Each cut requires a certain method of cooking, and he outlines methods and recipes for popular and less fashionable cuts of meat. 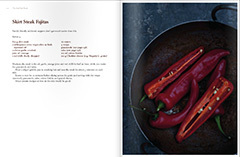 It includes evocative recipe shots and outstanding recipes for today’s kitchen capturing the quality of the produce at James Whelan Butchers. 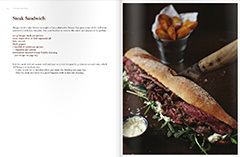 Available for Pre-Order at James Whelan Butchers. You will be taken to PayPal to complete your purchase. Please note: You do not need to have a PayPal account - payment is accepted via credit or debit card. add free copy of "An Irish Butcher Shop"